American Dream and The Great Gatsby research paper due and don’t know how to start it? How about like this? The phrase “The American Dream” has become a sort of cliché. But the very fact that Americans still speak of and believe in something they call the American Dream gives rise to the idea that there is a promise in American life, and the dream is achieving what our interpretation of that promise is. Knowing that, it is important to understand that the American Dream changes from time to time. The circumstances of America give rise to different perspectives on America. F. Scott Fitzgerald’s The Great Gatsby and Arthur Miller’s Death of a Salesman provide two different interpretations of the American Dream. 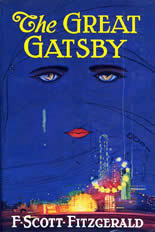 The Great Gatsby is the novel of the Roaring Twenties, the Jazz Age. Not only does the decade stand in direct contrast to the Great Depression that followed like night follows day, but the period has a frantic character to it, as people got rich, got drunk and lived for the moment. This is the zeitgeist captured in Gatsby. “The bar is in full swing, and floating rounds of cocktails permeate the garden outside, until the air is alive with chatter and laughter, and casual innuendo and introductions forgotten on the spot”. Gatsby’s American Dream is achieving the good life. That he is a bootlegger, with intimate ties to the underground, is not seen with disdain in the novel. Wolfsheim remembers a Gatsby fresh out of the war “so hard up he had to keep wearing his uniform because he couldn’t buy some regular clothes”. Themes in The Great Gatsby - The Great Gatsby also explores how the rise of this new millionaire class in the 1920s altered the American Dream for everyone. The Great Gatsby - Fitzgerald also presents a picture of the American Dream in The Great Gatsby, personified by Jay Gatsby, which exposes the myth of success and the trappings of wealth. Order a research paper on Symbolism from Paper Masters. Nick Carraway is the perfect narrator for The Great Gatsby because he has close connections with people living in the realm of all-consuming wealth. F. Scott Fitzgerald and Ernest Hemingway - F. Scott Fitzgerald was a 20th center American writer noted for novels and stories about the American Dream. Symbolism - John Steinbeck's The Grapes of Wrath is another American novel full of symbolism. Ideal of the American Dream - Ideal of the American Dream research papers look at the dream that most Americans had after World War II ended. Great Migration of Literature - Were the characters able to realize the American Dream in any shape or form. Discuss the role of history in literature. Social Class in American Literature - This research paper examines the view of social class in America as it appears ... Finn, F. Scott Fitzgerald's The Great Gatsby, and Ralph Ellison's Invisible Man. Paper Masters writes custom research papers on American Dream and Gatsby and account the classic novel The Great Gatsby by Fitzgerald.